Czechs love to eat a lot. They strongly believe in saying – A way to a man´s heart is through his stomach. Jaroslav Mestka, known as Jaro (Yaro), born in Prague, capital of the Czech Republic. After seeing turists and locals enjoying their trdelník, traditional Czech street food, he realised a potential of a future world hit. After moving to Canada he found out Vancouver is the best place to introduce his favourite meal to some new people. And so Praguery was born. It´s fun, we get a lot of positive feedback and get to see some of the coolest places on Earth from our food trucks. Plus we get to eat a lot of our product. people. And so Praguery was born. Because it´s… screw that, just come and try it. One bite is better than a thousand words. 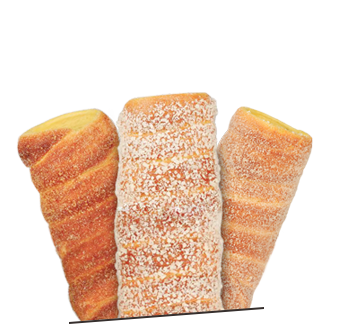 Chimney cake. Like a tube with a hole in it. Traditional East European treat with a taste out of this world. Prague Cone is derived from that, a similar thing, just narrow at one end, so it can hold all the goodies we put in, like an amazing ice cream and/or fresh fruits. 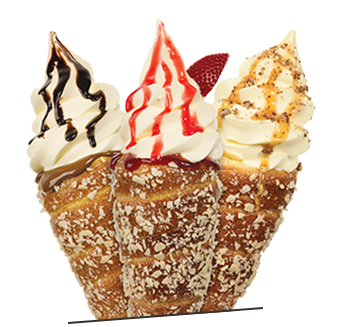 Imagine a doughnut cone with ice cream in it, then try to forget it a little, because doughnut tastes quite different. Also comes in savoury version. Really good for catering. How does that thing taste? Great. Dangerously great. We took the old recipe, which is pretty damn good by itself, and spent a lot of time fine-tuning it into new heights. Your taste buds will explode with delight. How traditional exactly is it? Very. First written note about it comes from 1450. Vlad the Impaler, the infamous Count Dracula, might have liked it. Hungarians call it Kürtőskalács, Czechs call it trdelník. Lots of consonants, don´t try to pronounce it.